A trip to Toronto isn't complete without experiencing Toronto's newly revitalized waterfront, or seeing Toronto's iconic skyline from the water. Sailing from Pier 6 at the foot of York St. & Queen’s Quay West, Mariposa Cruises delivers incredible cruise experiences right from the heart of Toronto’s Harbourfront. Perfect for individuals or group reservations, enjoy great food and hospitality with spectacular views of the harbour from the comfort of a Mariposa boat. Our vessels feature open air and interior decks, with fully licensed cash bar, restrooms and plenty of room to roam around or be seated. Our public cruises program features sunset dinners, lunch, weekend brunch and Sip & Sail cocktail cruises. Mariposa Cruises is the only cruise operator on the Toronto Harbour to offer multi-lingual audio Harbour Tours. 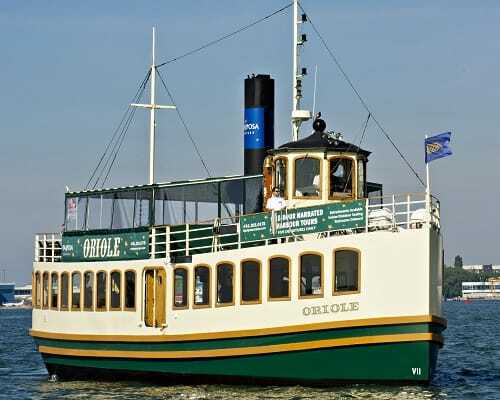 Our 45-minute harbour tours aboard the Oriole feature lively and informative narrations in six languages: English, French, Spanish, Mandarin, German and Japanese. Scenic Harbour tours operate weekends only starting in mid - May, and seven days a week from June to September, with 5 hourly departures at 12pm, 1pm, 2pm, 3pm and 4pm. Harbour Tour Prices (taxes excluded): Adult: $23.95; Student: $17.60 (must show Student ID card); Child/Youth (5-15): $15.33 ; Children ages 4 and under cruise FREE; Family Four-Pack: $58.92 (2 Adults plus 2 Youth / 5-15 years only).